Simply put, when your business uses a web-based point of sale (POS) system like Square, Lightspeed, etc. you need fast, reliable high-speed internet to painlessly process your customer’s transactions. No one wants to fumble through their purse for their long-forgotten checkbook, or worse, run to the nearest ATM for cash, because your salon’s internet is down. With over 75% of customers saying they prefer to pay with credit or debit cards, you can’t afford any down time. Your salon software powers everything from scheduling to bookings to those oh-so-important reminder texts and emails (Psst…did you know that reminder messages can cut no-shows by up to 35%?) If your internet is too slow or unreliable, customers won’t receive those reminders, won’t be able to easily rebook appointments, and you won’t be able to easily manage your staff and inventory. In short – if your internet’s not running, neither is your salon. So your POS and salon software are what you absolutely, positively need today, but what about tomorrow? It’s time to start thinking about the new front desk, which, ironically enough, probably won’t be a desk or be in the front of your salon. Instead, imagine your staff armed with tablets and helping your clients no matter where they are. Add in the potential for artificial intelligence applications and your salon’s internet and phone service is only going to get more important. Speaking of those tablets, they’re the perfect tool to help client’s find a new hairstyle (just for fun, check out this 2011 story mentioning Lisa Rinna’s already dated hairstyle and think about Lisa Rinna’s style today. But tablets don’t just give your clients the chance to make fun of the latest Real Housewives, they can also shop your salon right from their chair. Instead of trying to remember what products their stylist used, they can purchase them while the stylist is using them – increasing sales and client satisfaction. While trashy celebrity magazines are a salon staple that I personally hope never goes away, clients also want access to fast wi-fi to play games, watch videos, or even do a little work while they’re getting their hair done. Free, fast wi-fi is an expectation, not a luxury. That said, you can still put that wi-fi to use for your salon. One Canadian salon doubled the participation in a promotion that asked clients to post their selfies by taking advantage in their in-salon wi-fi to take those pictures in the salon and getting them posted before the clients even left the building. Clients got a great incentive to come back to the salon and their friends saw the salon’s great work. It was a big wi-fi win win. YouTube hair and makeup tutorials are not only a great way to learn how to work some magic with a curling iron and highlighters, they’re also an effective way to show off your staff’s skills. Take it to the next level by using the power of your high-speed internet to live stream a tutorial on YouTube or Facebook Live! While we’re not quite to the point where benevolent robots dress our tresses, we are at the point where digital applications can help stylists analyze the color and condition of their client’s hair on a molecular level. Likewise, smart hairbrushes use microphones to listen to the sound of hair as it is brushed and feeds that information to an app to help both your staff and their clients optimize their personal styling techniques. They even take the environment into consideration and make adjustments for wind and humidity. And, all of this is, again, powered by your all-important high-speed internet connection. A trip to the salon should be a peaceful oasis in the chaos of your client’s busy life. You need the right music, lighting, and temperature to help set that mood. 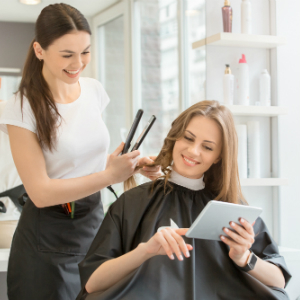 Smart salons use wireless solutions to cost-effectively control their salon’s atmosphere with a few touches to a tablet. No, it’s not just about saving the world from a bad hair day. Eco-friendly salons have already embraced water-saving showerheads, but with fast, reliable internet, your salon can also take advantage of the same tools you use to set the mood to protect the planet. For example, smart thermostats can adjust your salon’s temperature based on activity inside as well as the weather outside, while programmable LED light bulbs use less energy and save money. Ready to make the switch? Learn more about TDS’ high-speed internet and get a quote for your business. Memorial Day to July 4th – Celebrate unity and diversity!